I now have Windows 10. When I boot it up, it asks me to sign in with a password. I am the ONLY user & I don't want to type in my password every time. Is there some way to bypass this? This answer applies not only to Windows 10, but 8, 7, and Vista as well. Continue Reading: How do I sign in to Windows 10 automatically? You might be interested in this little anecdote. What follows is an increasingly commonly-attempted scam. Fortunately, the person reporting it had the right instincts and was able to avoid getting taken. I turned to my IT specialist son, who was the one who told me about Ask Leo. You have a rare gift for being able to explain technobabel. I also am humbled. I have a post graduate degree, but know what it feels like to be illiterate when it comes to reading about computer concepts via google searches! You help with that. It is interesting that you mention that you never intended this direction for your life. This is often the case, and I suspect there are other forces at play which help us get to where we are intended to be, depending on your belief system of choice. For example, my son, the IT guy, was completing a Master's in English, teaching, and working in a bar. He meets an owner of a computer firm who hires him because he can write and relate with people. Now he uses his writing and people skills to help explain computer concepts to people in small organizations for his firm's clients. Who would have guessed? Looks like you have found your niche. I wouldn't worry about not being a journalist. You are able to communicate well, both in written format, and in video. Also a more hard to define characteristic is one of honesty, and you give evidence of how you think about issues to arrive at your conclusions. That is, your "teachings" are not hanging in mid-air, but are grounded. So, in short, Ask Leo works, and works well. I have been a keen reader of Ask Leo for about 10 years. It was not too long after, that I decided Ask leo was my first place to go to with my question, not the last. 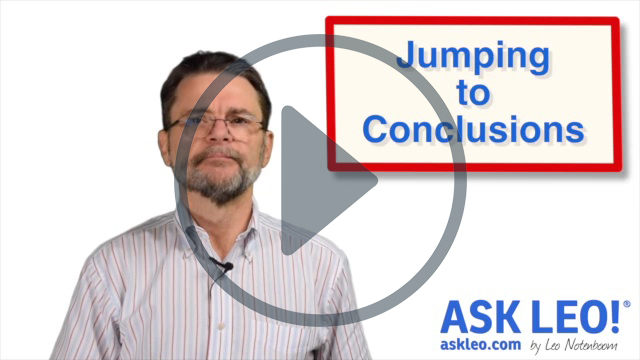 I have no doubt that the main reason your Ask Leo site has continued to grow in popularity is through your straight forward answers (you were never a Nerd) to the cutting edge issues posed. In addition, your advice over the past while on Windows 10 has been first class and has caused me to wait for a couple more months before moving up from 8.1. I also consult the maker of any software I am having a problem with as well as following PC World. However, my problems are few these days due perhaps to software makers paying more attention to the quality of their products or my subscribing to a top tune-up software product plus my staying safe by following your often stated Internet safety rules. Microsoft has to several reasons for Windows 10. Windows 10 is NOT a desktop operating system, yes it can currently run desktop applications, but it is designed as a front end for Microsoft's cloud services. Cloud computing is a wonderful idea if you own the cloud, and a terrible idea if you don't. Remember if you but something in the cloud it not yours any more it theirs! They are way behind in the capture of personal information about their users and they need to catch up. Currently Windows 10 has "sufficient" privacy features to make it appear that you can opt out. It is no surprise that they are all turned off by default. I suspect that over time they will disappear and/or the ability to turn them on will erode. The whole idea behind not publishing release numbers in the future is to avoid drawing attention to major changes, particularly in the level of intrusion. Currently you can install third party software (Firefox, Chrome, ...) by downloading it and installing, you don't have to rely on Microsoft's App store. I wonder how long they will allow this continue. Somewhere down the road I expect them to make the Microsoft App store the only App store. They need to make their apps more attractive than third party apps and by controlling the apps store they can control the pricing (Office365 $100/year - OpenOffice $25/month) and availability. For the record, I actually don't believe that any of this is true. It is a desktop operating system, their information capture is on par with many other online services, they're not doing away with release numbers to hide larger changes in the future, and they have no plans to make the App store the only way to get software onto your Windows machine. While some of those speculations are ludicrous (the app store one in particular - the justice department would be on them in a heartbeat, not to mention the market blow-back), I have exactly as much proof of my position as you do of yours: none. I'm just not that big a believer in conspiracy theories.